TuneBrowser is the software that manages a large number of music tune files on the disk. TuneBrowser is supporting native playback of high resolution (Hi-Res) PCM and DSD sources by ASIO and WASAPI. Supporting file types are: DSD, FLAC, TTA, MP3, AAC, ALAC, Ogg Vorbis, WavPack, Wave, AIFF, APE and WMA. Supporting gapless playback in all formats including DSD. Dynamic and smooth graphic rendering by DirectX (Direct2D). Supporting OpenHome. You can control the TuneBrowser with tablets or smartphones. C ++ template and internal structure utilizing CRTP, low CPU load. Associative search is easily possible under various conditions such as artist, composer, performer, content name and so on. Considering not only rock and jazz but also classical music to be able to adequately manage. To play music, playback device (DAC) compliant with ASIO or WASAPI is necessary. For the DSD native playback, device compatible with DSD playback by ASIO 2.1 or DoP 1.1, is necessary. TuneBrowser is provided with 3 versions. UWP version (See below for details). UWP version is for the Windows 10 Anniversary Update (Version 1607) and later only. UWP version of the TuneBrowser is provided in the Microsoft Store. Please click the badge above to access the Microsoft Store. UWP version makes safe downloading, easy updating, and complete uninstalling (^^). TuneBrowser can be used permanently as a free software (Free Edition). Free Edition can manage up to 500 music tunes. Besides Free Edition, there is Full Edition. Full Edition has no limitation of management (There are restrictions depends on PC resources, such as CPU or memory capacity). There is no other difference between editions like functional restriction or period restriction. 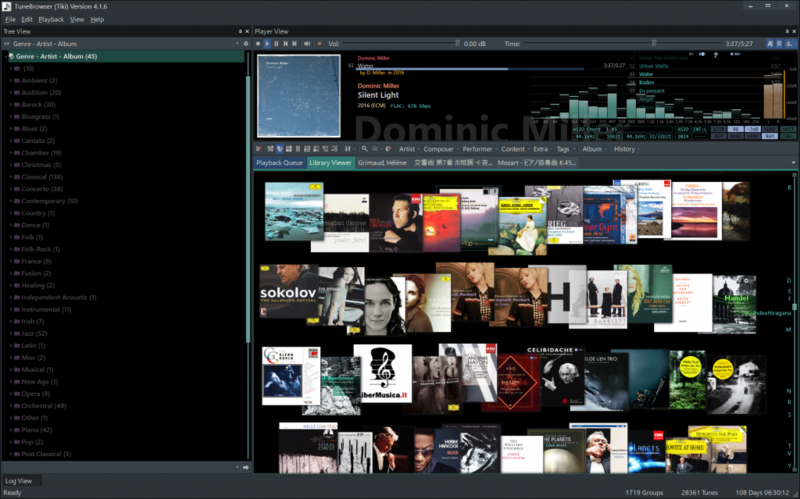 If you want to have a native DSD or Hi-Res Player simply, you can use the TuneBrowser as a free software continuously. You can use Free Edition by only download and install. To make it Full Edition, please register as shareware. For the UWP version, you can get the Full Edition License via the Microsoft Store “In-app purchase”. To access “In-app purchase”, please check the “About” dialog box of the TuneBrowser. You don’t have to manage the license key for the UWP version. Confirmation of the license will be done automatically through the Windows OS. To get the TuneBrowser license in the Microsoft Store, the Microsoft account is required. For the desktop x64/x86 versions, you can get the license key by registering via PayPal, then enter that license key into the TuneBrowser. To register as Full Edition, please use following PayPal link. After payment, PayPal will notify it to my system. Then, the email containing license key will be sent to you from my address. Email address registered in PayPal is not valid, or is too old. If you do not receive the email after waiting for a few hours, please contact me by using menu “Support” – “Contact” at the top of this page. The English version of the TuneBrowser is translated from Japanese. Almost user interface elements including parameter explanations are translated to English. Setup file (Installer) is same for English and Japanese. TuneBrowser detects language of Windows on startup, and dynamically switches language to use.